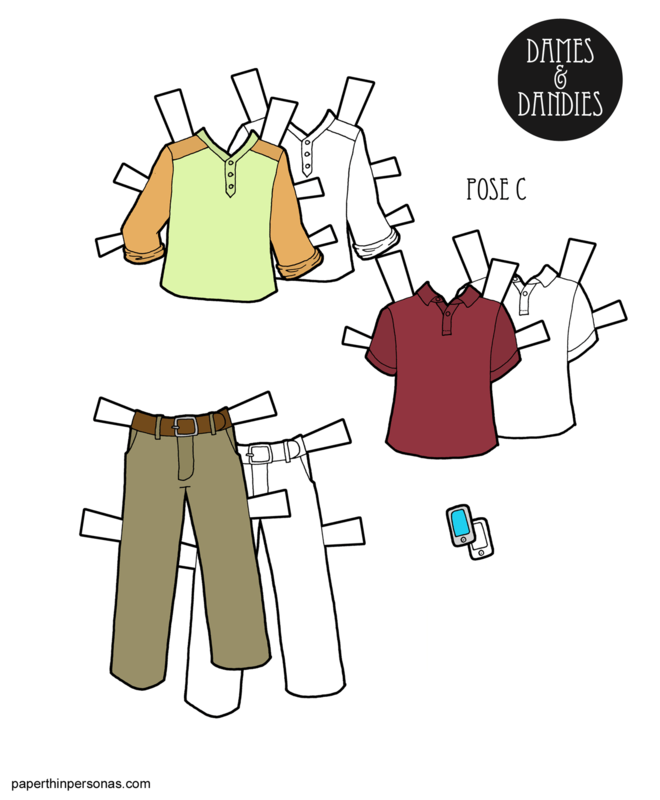 Since it’s Friday, C Pose Guy Paper Dolls Week is wrapping with this set of casual guy paper doll clothing. I feel like I haven’t done as many contemporary paper doll clothing sets for the Dames and Dandies as usual, but maybe that’s the three day a week updating schedule playing tricks on me. I am really hoping I can return to a daily updating schedule soon. I really do miss it. Anyway, so that’s kinda it. I’d love to be like, “Here’s the deep reason I drew some pants.” But honestly, I felt like drawing pants. The fact is that guy paper dolls just aren’t as easy for me to work on than lady paper dolls. I tend to have sudden flashes of inspiration for the ladies, but that rarely happens for the guy paper dolls. Maybe I need to read more men’s fashion magazines or something. I mean, men like being fashionable, too. Plus, there’s a second color scheme for today’s casual set over on my Patreon page for patrons. Join if you want to help keep the blog running and see more content!